The NFL Live crew discusses the top QBs & pass rushers in the draft, whether or not there was a disconnect between Aaron Rodgers & Mike McCarthy and the latest on Russell Wilson. The NFL Live crew discusses Gronk's retirement: the fantasy implications, his impact on the NFL and the Patriots future. Plus, a preview of the NFL owners meetings in Arizona. The NFL Live crew breaks down all the latest free agent moves and team transactions as well as some inside information from NFL Super-agent Drew Rosenhaus and more. It's the NFL Franchise Tag deadline day, we react to who got tagged and who didn't, including the latest on Landon Collins. Dan Graziano, Louis Riddick and Todd McShay wrap up the NFL Combine in Indianapolis, discussing the standouts from the weekend and the latest on Antonio Brown and the Steelers. Bill O'Brien and Kliff Kingsbury join Wednesday's NFL Live to talk about the upcoming offseason. Steelers GM Kevin Colbert and Eagles GM Howie Roseman discussed Foles & AB and much more. Today on NFL Live, we discuss where the Raiders might be playing next season as well as what DB and WR free agents your team should target this offseason. Today on NFL Live, Dianna Russini, Ryan Clark and Andrew Hawkins discuss the latest on Robert Kraft, Antonio Brown and give out NFL themed Oscars. The NFL Live crew discusses the breaking news around Robert Kraft. ESPN NFL Insiders Chris Mortensen and Adam Schefter lend their insights, as does ESPN NFL Analyst Tedy Bruschi & ESPN's Patriots Reporter, Mike Reiss. Also, more drama with the Steelers and NFL Combine news. The NFL Live crew talks Landon Collins' future, latest on Bell, Brown & some potential player tags. Also, the latest on Eli Manning & Case Keenum's shock over Joe Flacco's trade. On today's show we discuss the latest in the Antonio Brown saga. We talk with his agent Drew Rosenhaus about AB's future along with his other clients including Rob Gronkowski. Today on NFL Live we discuss Le'Veon Bell and the Pittsburgh Steelers using the Transition Tag, plus we take a look at the LA Rams roster and which free agents to keep. The NFL Live crew discusses the impact of Joe Flacco being traded to the Denver Broncos. What's next for Case Keenum and the rest of the QB targets this offseason and much more. The NFL Live crew talks Le'Veon Bell, Zac Taylor's new job as Bengals head coach as well as the Cowboys offseason plans. They also talk about Kyler Murray's sports decision and much more. The NFL Live crew talks Nick Foles contract situation, the offseason QB carousel, Antonio Brown latest, Derek Carr's contract and play a playoff game of "Still Here or Not". NFL Live breaks down Super Bowl LIII and Patrick Mahomes joins the show. On this edition of NFL Live, the crew discusses Larry Fitzgerald's decision to play another season and where teams in the QB market need to be looking for the right guy. Mel Kiper Jr., Todd McShay & Chris Sprow discuss Mel's first mock draft of the season, focus on Kyler Murray's potential (4:00), where the best skill position players will land (22:55), if this is the year the Patriots shoot for Tom Brady's NEXT heir apparent (28:00) and more. Plus, the guys run through a big mailbag (34:22). NFL Live looks ahead to the Conference Championship games, discusses the Antonio Brown drama and much more. The NFL Live team previews the NFC and AFC Championship games, discuss Kyler Murray's decision to enter the NFL Draft and more. Plus, we celebrate Drew Brees' 40th birthday. The NFL Live crew previews the divisional round playoff games, talk coaching positions being filled and check in with reporters across the country. NFL Live discusses the new head coaches hired around the league and looks ahead to the Divisional Round playoffs. The NFL Live team discuss the latest coaching news and what teams should draft a QB. Plus, the analysts play Panic or Patience and break down the top free agents. The NFL Live crew breaks down and picks all the big playoff games for this upcoming Wild Card weekend. The NFL Live team previews the Wild Card matchups this weekend, the likelihood of Antonio Brown being traded and more. Plus, an update on the coaching carousel. It's overreaction Monday, the NFL Live crew discusses what teams to watch out for in the upcoming postseason and what teams are in trouble as they enter the offseason. During this SC Special the NFL insiders break down the coaching carousel after six head coaches are fired after the final day of the regular season. The NFL Live crew takes you through all the wild scenarios of the AFC playoff picture as well as an interview with Colts RB Marlon Mack. The NFL Live crew reacts to news of Cam Newton being shut down for the season. Plus the holiday wish list for those teams already looking to the offseason. The NFL Live team ranks their panic level on Week 15 losers in playoff contention, get an injury update from Stephania Bell and interview Chargers DE Melvin Ingram. It's Overreaction Monday on NFL Live. Are the Patriots going to miss the Super Bowl, is the Colts defense better than their offense and many more storylines from around the NFL. The NFL Live crew breaks down who their positional spotlights are for the upcoming week's games. Plus, Steve Young joins for QB Bingo. NFL Live discusses Todd McShay's 2019 NFL Mock Draft and Lamar Jackson getting the starting job and much more NFL news. The NFL Live team breaks down the Titans win, previews Week 14 matchups and gets an injury update from Stephania Bell. It's Spotlight Thursday on NFL Live, our team breaks down which players will stand out in Week 14. Tedy and Darren share stories on when their respective teams ran the table and much more. The NFL Live team recaps Monday Night Football, break down the NFC and AFC playoff pictures, plus who should start for the Ravens. The NFL Live crew recaps Week 12 including the state of the Packers and if the Saints are the NFC favorites. The NFL Live team previews the Packers v. Seahawks game tonight and highlight the best and worst matchups of Week 11. NFL Live looks ahead to Monday Night Football's marquee Rams vs. Chiefs showdown after it's moved from Mexico City to Los Angeles. The NFL Live team previews the matchup of the week in Mexico City, break down Le'Veon Bell's potential landing spots, James Conner's impact on the Steelers season and more. The NFL Live team breaks down Week 9 storylines, preview Amari Cooper's Cowboys' debut, plus Le'Veon Bell updates and much more. The NFL Live team makes their picks for the upcoming weekend of football plus Tom Brady's thoughts on the Patriots matchup with Aaron Rodgers and the Packers. NFL Live recaps all of the trade deadline action and looks ahead to Week 9 with a Halloween themed show. It's trade deadline day! Our analysts cover all the day's trades from Demaryius Thomas and Golden Tate to Ty Montgomery, Ha Ha Clinton-Dix and Dante Fowler Jr.
NFL Live discusses the state of the Browns franchise after firing Hue Jackson and Todd Haley. The NFL Live crew makes their picks for the upcoming weekend's games, who do the experts think will win in week 8? Is it Panic or Patience time in the NFL? The NFL Live crew breaks down the latest trades and what teams are on the rise or fall around the league. The NFL Live crew breaks down the Amari Cooper trade and what it means for both the Cowboys and Raiders and much more. Today on NFL Live our analysts discuss OBJ's antics, make their picks for the weekend matchups and hear from Tom Brady at his press conference. The NFL Live crew covers all 32 teams! Our analysts talk Buffalo's Qb situation, Oakland's struggles and the owner's meetings. Plus, they discuss the 3-3 teams and which teams are the real deal. NFL Live dives into the new drama surrounding Odell Beckham. This time it's the Giants owner stirring up controversy! Plus recap Aaron Rodgers performance on MNF. NFL Live breaks down the Patriots big win over the Chiefs and recaps the rest of the biggest storylines from Week 6. The NFL Live crew celebrates Steve Young's birthday as they go over spotlights for week 6. Bengals WR Tyler Boyd joins the show and the crew talks Thursday Night Football. The NFL Live crew dives into the bad blood of the Steelers-Bengals Rivalry. Also, reports from New England and Kansas City with developments in Sunday night's big matchup. The NFL Live crew looks back at the best moments from the first 4 weeks of the season and much more. The NFL Live crew discuss what to look for in Thursday night's matchup between the Vikings and the Rams. Plus, discuss what the best and worst matchups are for Week 4. The cast breaks down the latest NFL news of the day including the Steelers win, the Everson Griffen story, Josh Rosen being named the starting QB and much more. NFL Live discusses Baker Mayfield starting for the Browns, what Jimmy Garoppolo's torn ACL means for the 49ers and other Week 3 storylines from across the league. NFL Live discusses the latest Antonio Brown controversy and the new 30 for 30 on Junior Seau. The NFL Live team previews Carson Wentz's start this weekend, Antonio Brown returning to practice and the two new head coaches facing their former team. NFL Live discusses the Josh Gordon trade and the state of the Steelers after Antonio Brown misses practice and much more. NFL Live recaps Patrick Mahomes' dominant start, Ryan Fitzpatrick's bold outfit and other Week 2 standouts. NFL Live previews the TNF Ravens-Bengals matchup and looks ahead to critical Week 2 player matchups. NFL Live discusses Aaron Rodgers' knee injury, the latest on Le'Veon Bell's holdout and which new head coach desperately needs a win in Week 2. The NFL Live crew recaps the Rams win over Jon Gruden's Raiders on Monday Night Football and breaks down the Week 2 Power Rankings. NFL Live breaks down Week 1 including the Packers incredible comeback and preview Monday Night Football. The NFL Live crew breaks down the key matchups and delivers bold predictions for the opening weekend of the NFL and much more. The crew breaks down the pivotal players for this weekend's matchups, including the QB, RB, WR and defensive spotlights. Go inside Odell Beckham Jr.'s quest to recapture the magic that made him the NFL's most eye-catching talent. Written by Seth Wickersham. The NFL Live team breaks down Aaron Donald's record-breaking contract, Jalen Ramsey's trash talk, and how team's get to a 53-man roster by the cutdown date. The NFL Live team breaks down Aaron Rodgers' contract extension, Week 4 preseason storylines, plus the 7 Wonders of the NFL World. Dan Orlovsky joins the crew to talk OBJ's new deal and we take you to his press conference. Then, discuss Josh Gordon's return, play Panic or Patience and talk rookie QBs. The NFL Live crew talks Overreaction Monday as Odell Beckham Jr. signs a record new deal. Plus, the crew also recaps week 3 of the preseason as well as the latest injury reports. The NFL Live team breaks down the Eagles 5-0 loss to the Browns, previews the weekend preseason games and quarterbacks to keep an eye on. Victor Cruz joins NFL Live as we talk which QBs will win starting jobs, which QBs still have time to win Super Bowls, Field's fantasy wide receivers, and player hold outs. The NFL Live crew talks Andrew Luck, Josh Allen starting, Jets QB plans and the new helmet rule. We also talk Adrian Peterson's new team and Aaron Rodgers' contract situation. The NFL Live crew talks about Andrew Luck's first start since his injury, Adrian Peterson signing with the Redskins, which rookie QB should start week 1 and much more. 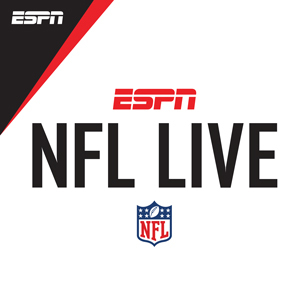 The NFL Live crew talks about what to expect from Carson Wentz this season, expectations for the Cowboys, Christian McCaffrey's journey to the NFL and what to look for in Week 1 pre-season games. The NFL Live crew talks OBJ's contract situation, Jared Goff's upcoming year, rookie QBs starting this week, HOF speeches and more. Dianna Russini hosts as Darren Woodson, Jeff Darlington and Adam Schefter wish Tom Brady a happy birthday! We also dive into the Hall of Fame Game and 2018 Class. On Today's NFL live we talk Carson Wentz's return from injury and how much longer Roquan Smith will hold out. The team breaks down the impact of Jon Gruden on the Raiders. Kirk Cousins faces Super Bowl expectations, but in Holland, Michigan, family and friends keep him grounded -- and rib him for writing book reports, by Courtney Cronin. John Fox and Josina Anderson join Wendi Nix to discuss Stefon Diggs' extension and dive in on topics around NFL Training Camps. Adam Schefter, Matt Hasselbeck, and Desmond Howard join John Anderson in Green Bay for Day 2 of training camp. They bring the latest on camps around the league. The NFL Live crew dissects the Josh Gordon's decision to not be at the start of Training Camp due to his mental health. Plus, Dabo Swinney joins the show. Darren Woodson and Jeff Darlington join Dianna Russini to discuss the QB competition in Baltimore, the most important moves of the offseason, and more. NFL Live covers 50 storylines that will loom large in the last 50 days before the 2018 season kicks off. The NFL Live crew recaps the Franchise Tag deadline, and Le'Veon Bell's agent, Adisa Bakari, joins the crew to discuss Bell's negotiations with the Steelers. DeMarco Murray joins the show and announces his retirement. Plus, the latest news on LeSean McCoy and It's Friday the 13th so our analysts tell scary NFL stories by the campfire. The NFL Live crew with guest Analyst DeMarco Murray look at the 12 teams that have never won a Super Bowl. Plus, some close calls and bold predictions for 2019. Dianna Russini hosts as Damien Woody, Field Yates and Andrew Hawkins rank rookie quarterbacks, discuss available Free Agents and wish Antonio Brown a happy 30th birthday! The NFL Live team discuss who has the best backfield in the NFL, the best case scenario for the Browns and which team could go from worst-to-first in the NFC/AFC West. NFL Live looks at the Patriots depth chart, considering Julian Edelman's suspension. Plus who could go worst-to-first in the AFC East and NFC East? Wendi Nix hosts as Dan Graziano and Damien Woody discuss Kam Chancellor's decision to retire. They also break down who in the AFC/NFC South can go from Worst to First. Jac Collinsworth hosts as Damien Woody, Dan Graziano and Josina Anderson break the news of Jameis Winston's 3-game suspension. Also, an early interview with Jay Ajayi. The NFL Live crew discusses Aaron Donald's contract situation and continues the week-long QB Roulette segment, this time with the AFC and NFC South. The NFL Live crew weighs in on Julian Edelman's ongoing appeal of his suspension. Plus, it's QB Roulette week and we dive into the AFC & NFC East Divisions. Do they spin the wheel or not? NFL Live's weeklong 5 In, 5 Out series dives into how the Packers get back in the playoffs, plus what could keep Carolina out and more. NFL Live dissects the tension between Julio Jones and the Falcons organization, plus a discussion of the toughest WRs to cover and more. Tom Brady discusses his plans to continue playing in the NFL and his relationship with Bill Belichick. Also, Odell Beckham Jr. says he will attend training camp in July. As NFL Minicamps continue, Andrew Luck makes progress while Aaron Donald holds out. Adam Schefter, Bill Polian and Tedy Bruschi dissect the latest news around the league. With 28 NFL Minicamps underway, NFL Live dives into the biggest storylines thus far. Plus, Odell Beckham was on the field for the Giants and Andrew Luck was back to throwing a football. In search of the real Mike Tomlin, a coach who's been celebrated and derided - but rarely understood. By Tom Junod. Are the Browns taking Baker Mayfield with the 1st pick? We discuss who the top WRs are in the draft. We talk possible turmoil between the Falcons and Julio Jones. Mel and Todd alternate first round picks for all 32 teams to create the "perfect" mock. On Friday, the NFL Live crew analyzed Dez Bryant's future, broke down the newly released NFL scheduled and continued to preview the 2018 NFL Draft. NFL Draft prospect Bradley Chubb joined NFL Live in studio. The crew also discussed if Tom Brady will play next season and talked to James Harrison about his recent retirement. Suzy Kolber and the NFL Live Crew talk about Mel Kiper's Grade A Mock Draft, the Browns' plans for their early draft picks and Robert Griffin III's fit in Baltimore. On Today's NFL Live, with 20 days left until the draft, we've got 20 storylines to follow before the big day. Bears coach Matt Nagy joins the show. Way too early fantasy news. The NFL Live Crew discusses what the outlook is for the seven NFL teams who have new coaches this season, is the Patriot way becoming too much for Gronk and more. The NFL Live crew recaps news from the annual NFL coaches' breakfast, plus much more. The NFL Live crew visits Saquon Barkley's Pro Day, discusses Carson Wentz and his return from injury, plus much more. The NFL Live crew discusses where Kirk Cousins may land in free agency, analyzes Sam Darnold in Todd McShay's Mock Draft 3.0 and explored Richard Sherman's future. Guest analyst DeAngelo Hall joins Field Yates, Tedy Bruschi, and Wendi Nix for all the news you need counting down to the NFL's Franchise Tag deadline. The NFL Live crew recaps the NFL Scouting Combine and discusses possible landing spots for Kirk Cousins. The NFL Live crew wraps up coverage at NFL Scouting Combine and we hear from some of the top QB Prospects. Guest analyst DeAngelo Williams joins Dan Graziano, Field Yates and Dianna Russini to discuss Blake Bortles & Le'Veon Bell. Plus, another edition of Overreaction Monday! Damien Woody, Josina Anderson and Marc Ross join Suzy Kolber to react to Chiefs CB Marcus Peters being traded to the Rams and more. Mel Kiper Jr. joins the NFL Live crew to talk about his latest mock draft. Also, was it smart for the Dolphins to franchise tag Jarvis Landry and which prospect will make an immediate impact in the NFL. Dianna Russini hosts as Bill Polian, Louis Riddick and Dan Graziano discuss Le'Veon Bell's contract situation, the pending Free Agent market and more. Bill Polian, Louis Riddick and Jeff Darlington join Dianna Russini to predict who will be the Week 1 starting quarterback for each team in 2018. Damien Woody and Jeff Darlington join Suzy Kolber to discuss AJ McCarron, potential destinations for Kirk Cousins and much more. The NFL Live crew discusses Frank Reich to the Colts. Also, Dan Graziano plays matchmaker to see which teams would fit best for Kirk Cousins in 2018. The NFL Live crew discusses six of the seven new NFL head coaches in-depth, plays Panic or Patience and much more. NFL Live discusses how teams with QB questions need to fill the position in the off-season. Also, Overreaction Monday! Victor Cruz joins the NFL Live crew to talk Eagles and Patriots Super Bowl prep. We also check in at the Pro Bowl and discuss Pat Shurmur to the Giants. The NFL Live crew is joined by Browns OL Joe Thomas. Together they talk new Giants HC Pat Shurmur, why Drew Brees should go to Cleveland and check in on Steve Wilks in Arizona. The NFL Live crew chimes in on the Cardinals new head coach Steve Wilks, reacts to Championship Sunday and talks the future of Case Keenum and Blake Bortles. Suzy Kolber, Tedy Bruschi, and Darren Woodson talk championship weekend and Brady's hand, also TAPE-OFF and coaching updates with Adam Schefter. The NFL Live crew discusses why the Steelers might have fired Todd Haley, ranking of the best and worst free agents this year and the latest updates from the final four teams. The NFL Live crew talks playoff prep, position spotlights and plays Quarterback bingo. Bill and Tedy take an adventure and Tom Brady speaks at the podium. Our NFL reporters update us on the latest news from each team going into Divisional Weekend. Was Seattle's firing of OC Darrell Bevell smart? On Tuesday's edition of NFL Live, we react to Tom Brady's comments regarding Seth Wickersham's article, the latest coaching changes and debate who has the easiest path to the Super Bowl. Plus, Marcus Mariota joins the show! Trey Wingo hosts as Tedy Bruschi, Darren Woodson, Adam Schefter & Steve Young discuss coaching vacancies and spotlight the best and worst playoff matchups! The NFL Live crew breaks down the big matchups for Wild Card Weekend, the early coaching changes in the NFL and more. NFL Live discusses who the stand outs are in the final week of the regular season. Plus, we breakdown who will come out on top of the NFC South and what has happened to the Giants. The NFL Live crew discuss Landon Collins recent statement about Eli Apple, Eli Manning, James Harrison's new home, the best of 2017 and much more. Louis Riddick, Josina Anderson, Adam Schefter and Jeff Saturday join Dianna Russini to recap MNF, discusses their picks for MVP and much more. Our analysts give us their picks for this weekend's games and discuss how the outcomes will affect the playoff picture. Can Matt Ryan and the Falcons take down the Saints? The NFL Live crew discusses the crazy ending to the Patriots/Steelers game, the Thomas Davis two-game suspension and dissects week 15's news and notes. The NFL Live crew discuss the battle of AFC juggernauts Patriots vs Steelers, then give you their picks for this weekend's games. Casey Hayward joins the show. NFL Live discusses the major matchups this weekend that will help decide division winners. Plus, Aaron Rodgers is set to return for Green Bay but is it too late? RGIII joins the show as a special guest! The NFL Live crew talks Carson Wentz's injury, Seahawks ejections, Monday night football and the AFC West standings. They also play Overreaction Monday and recap the snow-bowl game. Today on NFL Live we discuss the Thursday Night matchup. It's Spotlight Thursday, find out who to look for in this week's games. CJ Mosley joins the show and we discuss possible suspension changes. The NFL Live crew talks all the recent suspensions, update Ryan Shazier's status, talk playoff push and dive into Giants new interim coach. The NFL Live crew tells you what you need to know for Sunday's Games. Schefter gives us all the latest injury updates. We discuss the Cowboys Thursday Night win. The team talks Eli Manning, and what the next step is for the Giants. We have Damien's dumpster fire! Adam Schefter gives us the latest injury updates, and the Cam Newton presser. At 19, Amobi Okoye became youngest player drafted in NFL history as the Texans No. 10 pick in the 2007 draft. Now Okoye wants to become the first player to beat encephalitis. Seattle Seahawks defensive end Michael Bennett is a powerful voice against social justice. Bennett also uses his platform to help juvenile's in the criminal justice system. The NFL Live crew recaps the Sunday games, play overreaction Monday, discuss "Sunday's Best" and admire Sunday standouts. Also, the crew previews the Falcons-Seahawks MNF matchup. It's Spotlight Thursday on NFL Live. Our analysts discuss which players have the best and worst matchups, who will have a breakout game, and storylines you should follow. NFL Live discusses the Bills benching Tyrod Taylor for Nathan Peterman. Plus the big NFC matchup between Vikings and Rams. Will Witherspoon played LB in the NFL for the Panthers, Rams, Eagles and Titans. Today, he's a farmer in Missouri pushing the benefits of local farms and farm fresh foods. It's Overreaction Monday on NFL Live. The crew chops up every big topic from Week 10 including Ben McAdoo and the Cowboys minus Zeke Elliott. The NFL Live crew talks Ezekiel Elliott's hearing, preview the Thursday night game, talk the ageless Tom Brady and play quarterback bingo. The NFL Live crew discusses the return of Teddy Bridgewater, problems in the Giants organization, Ezekiel Elliott's case and which backup QB might get a win this week. The NFL Live crew discusses Teddy Bridgewater's activation, Aaron Judge stops by the show to talk about football and more. Plus, Josh Gordon's comments about his substance abuse before games. Sam Gado was nine when he immigrated from Nigeria to the U.S. He was 13 when he started playing football. At 27 he retired to become an ear, throat and nose doctor. The NFL Live crew discuss the breaking news of Mike Evans being suspended, Jameis Winston's shoulder injury, break down their overreactions from the big wins and losses from the weekend and more.